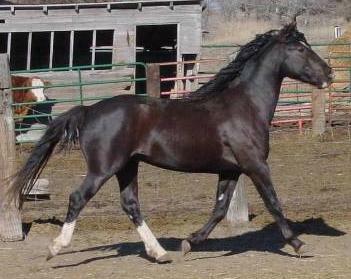 Smoky black is the result of one cream dilution gene on a black horse. Because one cream gene (heterozygous) does not affect black hair, there is not much effect when it is present on a black horse. 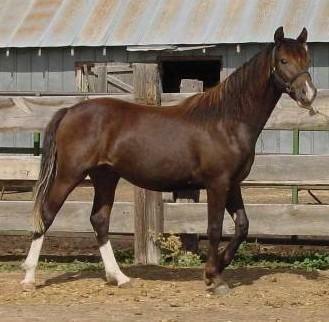 However, smoky blacks can be some very odd shades, especially when in weathered or sun faded coat, and as a result are often mistaken for liver chestnut, brown, grulla, or dun. Historically this has caused many smoky blacks to be registered as one of those colors (or as simply "black", which does not accurately reflect the presence of the cream gene). 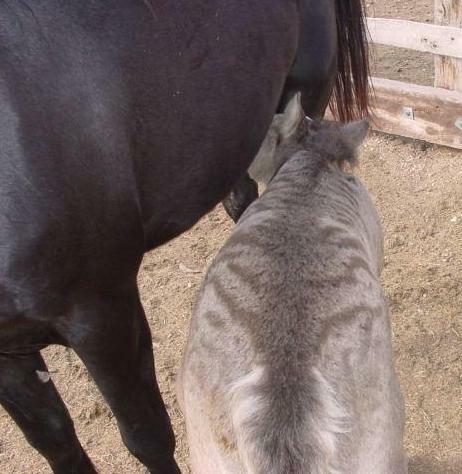 All smoky blacks will have at least one cream dilute parent. 1. The LU Sheep Ranch, where the color is possibly coming from Night Tide. a. Dawnglo (Night Tide X Ishawooa), 1939 palomino mare. Found in Californio, San Willidust, and Tio Lalo descendants. 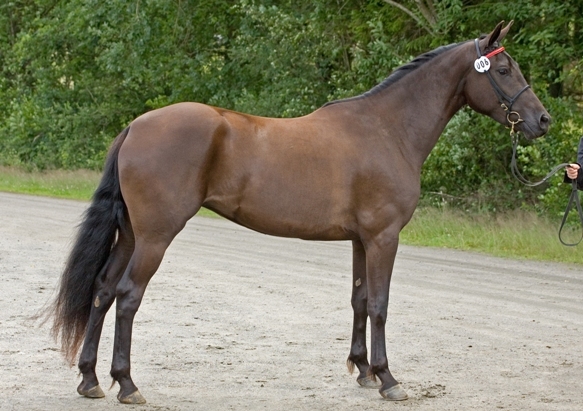 c. Luxury (Night Tide X Mallow), 1939 buckskin mare (registered as dun). Found in the Aquila's prefixed colorfuls, Dickie's Pride, Desert Sands, and Yellow Bird descendants. 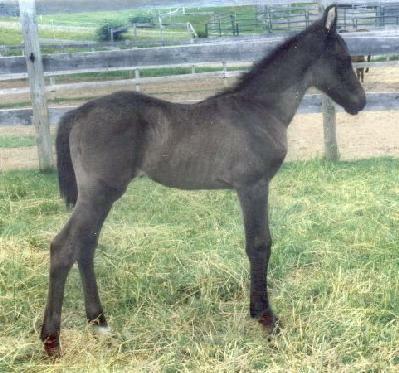 d. Luellen (Night Tide X Ethete), 1939 smoky black mare. Found in descendants of Morgan Gold, Nugget Hanneman, and Rusty Walker. 2. 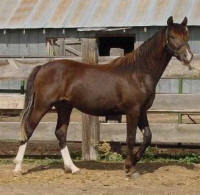 The Cross Ranch, cream dilution originating from the X registered dams of these two horses. a. Ketchum (Joe Lewis X Du Noir Strip), 1950 smoky black stallion. 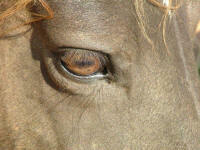 Found primarily in the many horses of Chingadero descent. b. Buck (Imperial X Nellie), 1930 buckskin mare. Found the numerous lines of descent from her daughters, Yellow Girl and Smokie. 3. Gwenie (Golden Jubilee X Gwenalan) 1951 palomino mare. 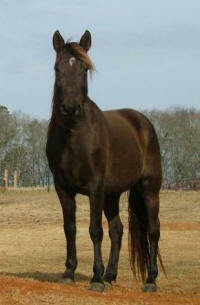 Gwenie got her cream dilution from her sire, a palomino X-registered son of Jubilee King. Gwenie's color line comes down to us through horses of the Jan Mabie Pace lines. 4. Cotton Hill Daisy (Amigo Mick X Daisette), 1949 palomino mare. The source of Cotton Hill Daisy's cream gene is unknown, but may have come from her granddam Madonna, a black daughter of Go Hawk (black, with no dilution lines behind him) and Red Ruby (who may have been some sort of cream dilute, misregistered as chestnut- her dam, Ruby, is also the maternal great grand-dam of Night Tide). Cotton Hill Daisy's color line is represented by horses from Sunup Neptune lines. 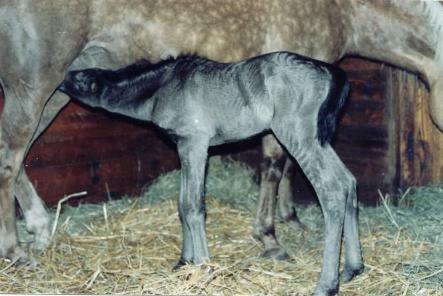 SPRING HOLLOW BLACK ICE (MEMC Tequila Cuervo x Goings Dream Come True), 2005 smoky black mare (pictured as a foal) owned and photographed by Lynn Skillington. 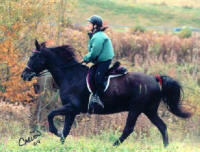 SMALAND KOKOPELLI (Sir's Sunny X Jarvin Black Shadow), 2000 smoky black gelding owned by Molly Corcoran, Roseland, VA. If you look closely you can see Koko's amber eyes, which are often present on heterozygous cream dilutes. 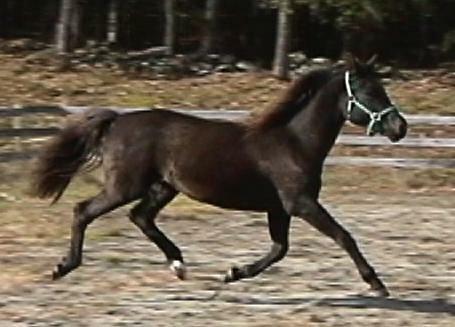 GOLDGET KITTY (SC Island Centavo X Treasure Golddust), 2004 smoky black mare owned by Sara Alvrud, Sweden. Photo by Johanna Lagnevall. 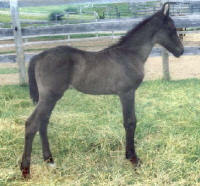 MEMC LADYHAWKE (MEMC Tequila Cuervo X Aswyn Nora Ashbrook), 2005 smoky black mare (pictured as a foal) bred by Jennifer Monroe, MEMC Morgans. If you look closely you can see the bluish eyes that many cream dilute foals are born with. 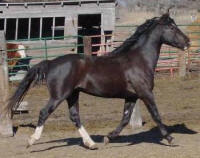 Ladyhawke was owned by Susan Beach, Beaches Triple T Ranch. COACHMAN'S SIMPLISTIK (Kickapoo HDC Chief X Coachman's Saffire Noire), 1996 smoky black mare, owned by Mosswood Sport Horses. The picture of her on the left (standing behind her bay colt) shows how sun faded smoky blacks can look very much like grullas! 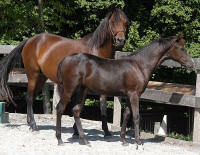 On the right is the same mare in winter coat. Photos by Cindy Taylor. Many, but not all, smoky blacks have amber eyes, as shown here on COACHMAN'S SIMPLISTIK. Amber eyes are not uncommon on single cream dilutes. LBF HICKORY SMOKE (Tru West Gold Peso X Rocking M Rosa Lita) 1998 smoky black gelding owned by Esther Fiddes. 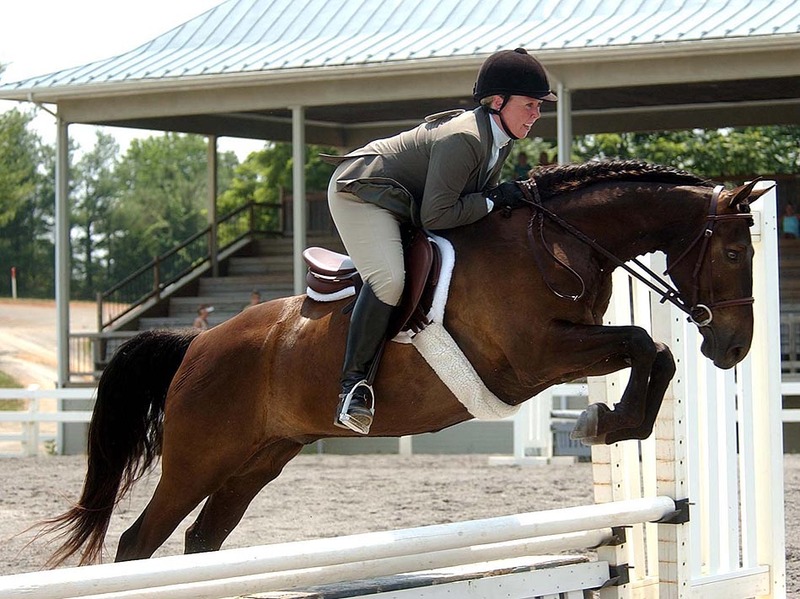 "Pokey" is a very successful competitive trail horse. He was Reserve Champion for CT Morgan and also for NEMHA for CTR in 2003, and Champion for CT, and Reserve for New England, for 2004. He received a silver medal for the 2004 year end from ECTRA. 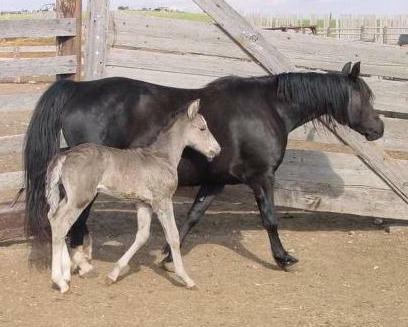 Smoky black foals can be very silvery and may have primitive markings as well, leading some breeders to mistake them for dun or grulla. All four photos above: TRIPLE S SILVER SMOKE (Triple S Chinook, palomino X Whippoorwill Victoria, black), 2002 smoky black colt. DNA tested as "Ee" (heterozygous black) plus Cr (cream) by UC Davis. In the first two pictures he is pictured as a suckling. 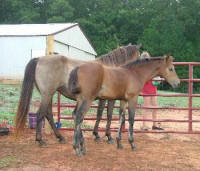 No, that’s not a grulla foal! Silver Smoke does not have a dun parent, so he cannot be a grulla. 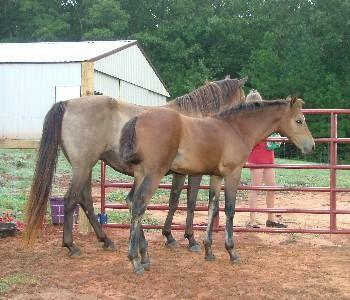 In the third picture Silver Smoke was a yearling and in the fourth he was a two year old. 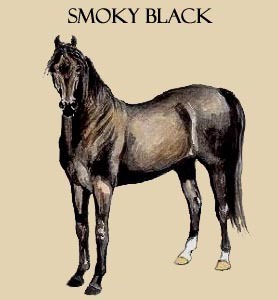 You can certainly see how smoky blacks were mistakenly registered as chestnuts, duns or other colors over the years! 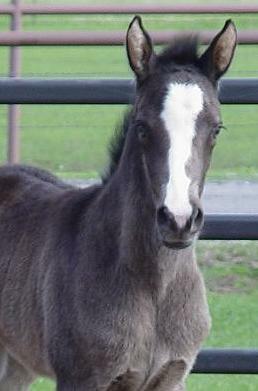 It is not uncommon for foals of all colors to have primitive markings that mimic dun markings, but Silver Smoke's are more extensive than most. This is nature’s camouflage for a young foal. Generally these markings will completely disappear with the shedding of the foal coat. Some may linger on into adulthood. Keep in mind that they are not the same thing as true dun markings, which are due to the dun dilution gene. Photos courtesy of Nathan Painter. 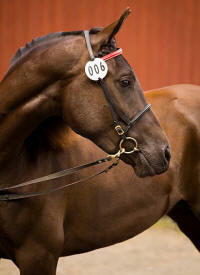 LBF CALL ME MADAM (LBF Yukon Gold X Rocking M Rosa Lita) 2002 smoky black mare owned by Polly Smith. She is a confirmed smoky black via UC Davis Red Factor/Agouti and Cream testing. The second picture is of Madam as a two year old. You can see how some smokies could be mistaken for liver or black chestnut.